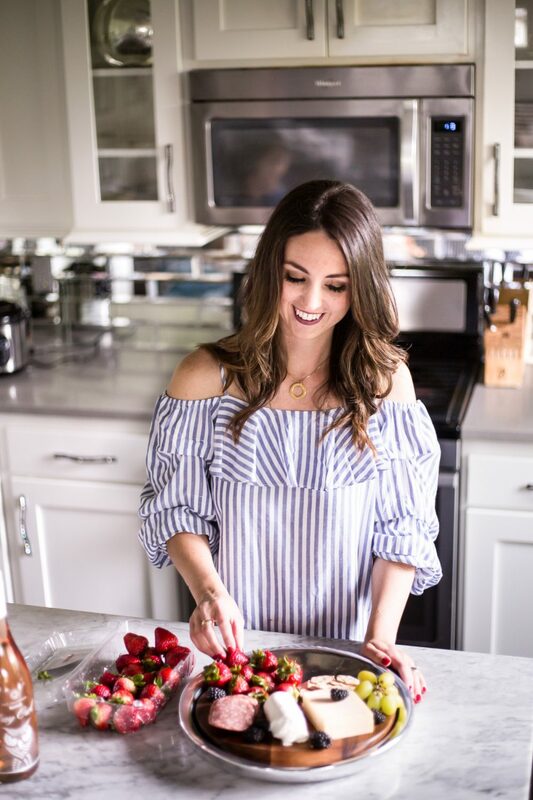 Last month I had the amazing opportunity to take part in Jenna’s Creating a Meaningful Home series over at SAS Interiors. I loved being part of the series and thought I’d share my post over here as well. This topic is really important to me and is one that I think everyone should think about. After all, bringing meaningful pieces into a space is what distinguishes a house from a home. So now you may be asking, how DO you create a meaningful home? I think the answer is different for everyone. 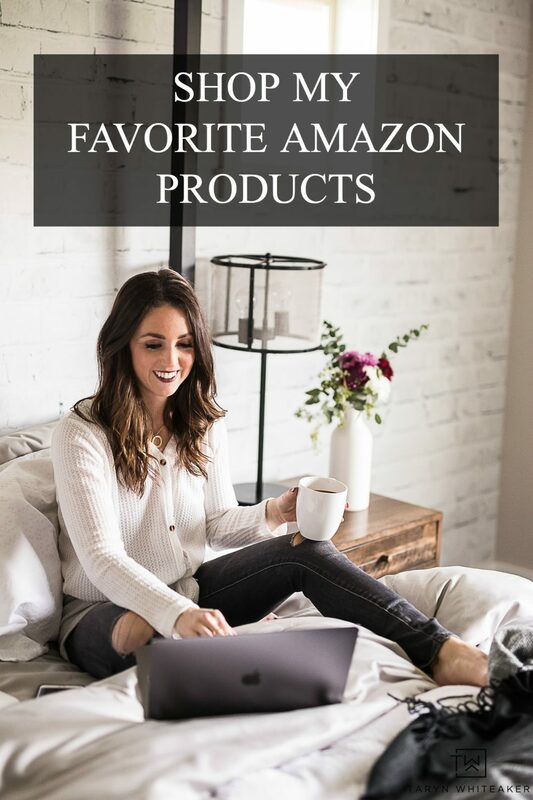 You can start by checking out all of the other great posts from other bloggers and today I’m sharing with you my story. For me, meaning comes in the little things. I have a more minimalistic approach to decorating, so I have a very subtle way of adding meaning to our home. While it may not be obvious to an outsider, I’ve incorporated pieces of my family and I into almost every project I’ve completed and to me defines meaning. Last fall I completed our Family Room Makeover and today I’m going to let you in on some of the secrets behind the projects. My DIY Eye Chart is one of my favorite projects, ever. 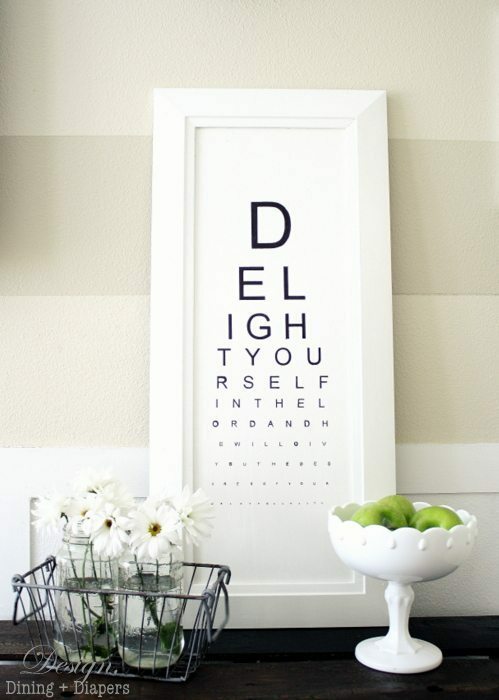 It’s hard to see it at first, but the eye chart actually spells out my favorite scripture, “Delight yourself in the Lord and He will give you the desires of your heart”. It’s something so subtle but so significant to me. To you this may just be another family room, but I see a room full of meaning. To the far left you’ll see my Eye Chart that I mentioned above and next to it is an old gas can that belonged to my grandpa. And that planter, those may be just numbers to you, but it is actually our wedding anniversary. Above the window sits the Rustic Growth Chart I made for my daughter (and future kiddos). While it may just look like another piece of rustic decor, for us it’s a piece of our family history. When I look up at that every day, I see the tags that mark our daughter’s height year after year and it’s hard not to think about all that has happened in just a few short years. 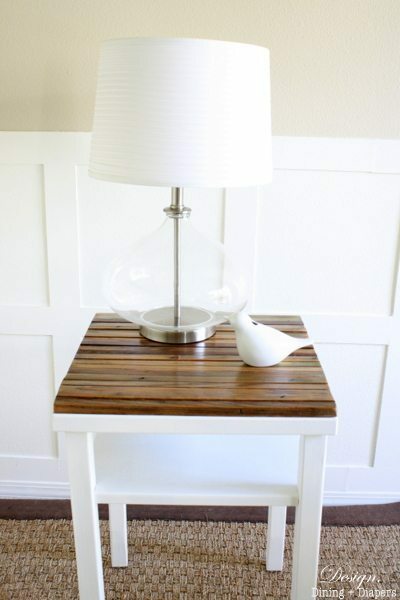 Here is a Side Table that I made over using reclaimed wood. It’s a piece that we will take with us when/if we ever move and what I love is that we will actually be taking a piece of our first home with us. You see, the wood I used on the top of the table I found in our backyard. It came from an old trellis that we found behind some raspberry bushes and I used it to turn this table into something new. Yet again, something subtle but holds significance for my family. 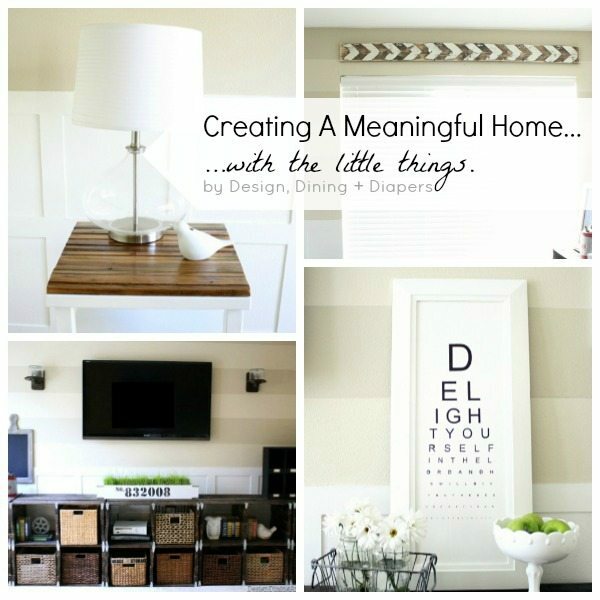 These are just a few of the ways that I have created meaning in my home. For me, meaning doesn’t have to be obvious to the eye, it just has to be felt. You can view my full family room reveal here. The series is still going on, click here to read all of the other posts from some fabulous bloggers! How do you create meaning in your home? 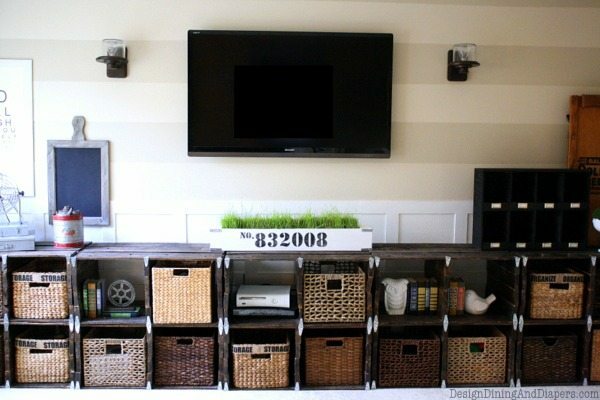 Love how you incorporated decor with personal significance in your home. Very inspiring post, Taryn! 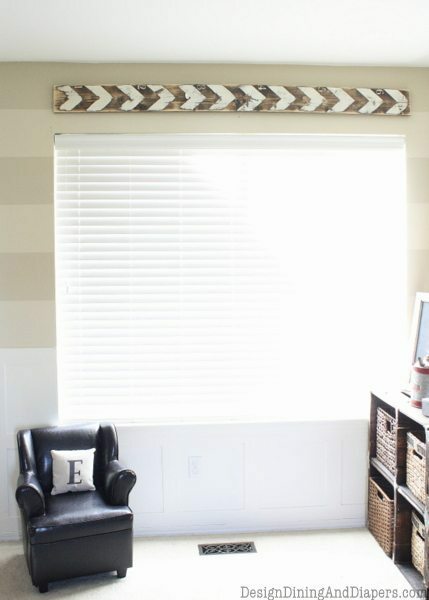 I love the eye chart…that is beautiful and such a great idea. Everything in this space looks wonderful! So glad you did this post, I just did my buoys for our bedroom and didn’t realize until after my kids had picked our wedding date numbers. It made me love them even more. This is such an inspiring post. I especially love the scripture verse DIY you made and how you incorporated your anniversary date into your decor. Lovely! I love all your personalized ideas. I just made the rustic growth chart and I was curious how you mounted it above the window. I have no idea if you will see this response on an older post, but I figured it was worth a shot!!! Keep up the good work!! !